Not always closeness implies harmony and cordial relation. The same has happened between out Red Planet Mars and its closest satellite Phobos. 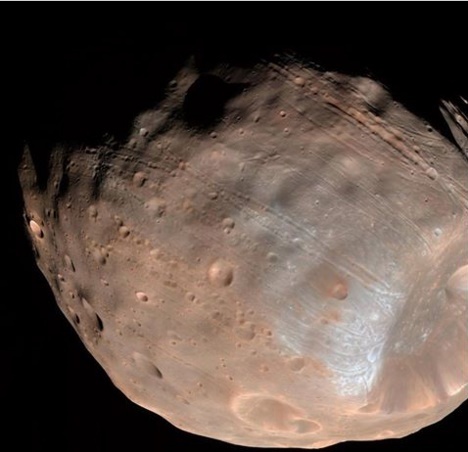 NASA researchers have studied and come to the conclusion that Mars is tearing apart its own moon Phobos and a time may come when Phobos will tear apart from Mars. The break up of the bond between Mars and Phobos will not happen until 30 to 50 billion years. Researchers have observed that Mars is closest to Phobos than its other satellite is to its own planet in our solar system. Scientist Terry Hufford told in an interview that they have noticed grooves on the Surface of Phobos which are presumed to be the result of tidal forces or the gravitational force between the Red planet and the moon. Terry Hufford said that the tug of war between Mars and Phobos is the main reason behind the formation of the humongous craters and grooves. NASA presented the recent revelation on the Phobos stretch marks at the Meeting of the Division of Planetary Sciences of the American Astronomical Society. Mars is pulling Phobos towards it at the rate of 6.6 feet (nearly 2 meters) every century. The huge gravitational pull is bolstering the stress factor on the beautiful moon of Mars and causing big ugly scars on Phobos. Phobos, the victim of gravitational pull of Mars will get rid of this tug of war, some 50 to 60 billion years ahead.